Hotel Radio is an indie rock band based out of Kansas City, MO. The band is comprised of Patrick Meagher - vocals, guitars, keyboards; Jason Scheufler - vocals, guitars, keyboards; Kevin Maret - drums/percussion. Their self-titled debut EP includes the track, "Our Summer," as featured in the theatrical trailer for The Kings of Summer (2013 CBS Films). Hotel Radio's debut EP displays their range of musical influences. Strong melodic lines are delivered effortlessly from lead singer Patrick Maegher. Jason Scheufler displays his multiple talents with compelling performances on guitar, mandolin, ukulele, keyboards, and background vocals. Creative and musical percussion lines by Kevin Maret add a layer of complexity to the band's sound. Lush and infectious counter melodies are woven throughout their songs to add depth. Hotel Radio's music ebbs and flows naturally and builds to match the lyrical intensity. The musicians' versatility as performers and composers is evident in this debut EP. 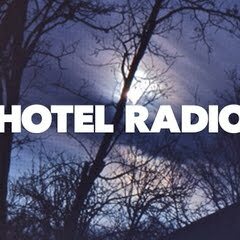 Hotel Radio's writing will keep you engaged and guessing as to what turns they will take next.